Anthony Crolla has pleaded with Ricky Hatton to keep his world title dream alive. The British lightweight champion is desperate to face WBO interim holder Ricky Burns in March. But the Battle of Britain is on the verge of collapsing with no agreement yet reached between rival promoters, Hatton and Frank Warren. Warren is now set to announce another opponent to take on Burns in Glasgow on March 10 unless a deal can be agreed. Crolla, from New Moston, said: “When you come into the sport a world title shot is what you dream of. “It’s a fight I believe I can win and I believe it would be a great fight. “I want to become Manchester’s first world champion since Ricky Hatton and become Ricky’s first world champion. “I’d love to make the city proud. Hatton has already made it clear he is willing to do business with Warren, who was his own promoter when he won the IBF light-welterweight crown against Kostya Tszyu on an amazing evening at the M.E.N. Arena in 2005. The Hitman said last month: “Although I and Frank have had our differences in the past, the respect I have for him has never been in question. That sparked hope that Crolla and Burns would get in the ring together in the New Year in what would be a mouth-watering contest. But so far no fight has been agreed, despite a spokesperson for Warren confirming that an offer had been made. That is heartbreaking news for Crolla, who was hoping to set up massive fights with Burns and Kevin Mitchell this year. Hatton Promotions declined to comment when approached by M.E.N. Sport. 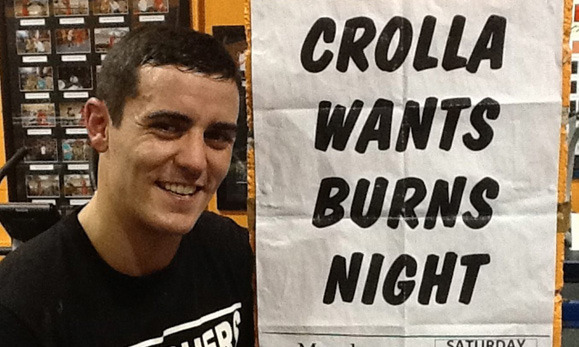 Crolla’s trainer, Joe Gallagher, added: “He’s been offered the fight and he’s happy to take it. Crolla, who is self-managed, has not given up hope of the fight of his life so far being resurrected. The 25-year-old said: “Sometimes the hardest part of boxing is everything that comes with it. “The easiest thing is getting in the ring and fighting. “If the fight is going to be done, it’s got to be done soon. I just want the chance to fight for a world title.